Laurie Here - Contemporary Fiction and MORE - Book Reviews: #StackingtheShelves #46 blog updates and week's end for 8-13-16! 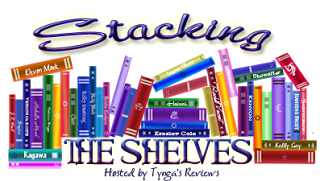 #StackingtheShelves #46 blog updates and week's end for 8-13-16! Thanks to our Sponsor, NO SPONSOR this week??? I will also be linking this post AND my reviews to Saturday Situation - NO Saturday Situation SINCE JUNE 24TH! I'm about to give up! Perhaps it's for the summer, but nothing is mentioned about it, so . . . ??? as well from now on, too! That is a place to link ALL THINGS BOOKISH! I'm anxious to start posting there!! Check it out, too! Well, this week did not turn out the way I had it planned for my blog! I was especially upset because I was almost done writing TWO reviews and getting ready to post them when it happened! What happened? Our power went out!! Grrrrrrr!!! Equipment failure. UGH! I found out later it was two fuses that burned out, exploded inside a large transformer, whatever. This was one of the HOTTEST AND MOST HUMID weeks our state has seen so far this summer, (thankfully because it could be worse!) but we lost our power on Thursday, 8-11, ALL day into the evening. It was AWFUL!!! There was NO BREEZE! NOTHING stirred all day! Nothing but myself! I was MISERABLE! We are in DIRE NEED of having our trees cut back ALL AROUND OUR CITY again so if the branches are in the way, or if a branch breaks from it's own weight, or a storm, rain, or whatever it may be happens, IF they were cut back we would not lose power like we have been SO OFTEN! About 15 years ago Detroit Edison cut the trees back then, and this DID help to keep our electric ON! No more trees falling and killing our power OR hurting people! They cut the trees in ALL of lower Michigan! It was AMAZING how they went about it! Thank gosh they did it! Imagine how BAD the trees would be today! Well, the trees are out of control, again, and they NEED to cut them back again! I did check to find a way to write to the company and complain about the trees, either. ALL we have is the Customer Service phone number and NO EMAIL! Probably on purpose! (Since they cut the trees back, the electric companies have been deregulated.) Essentially there are safety rules the electric company must abide by, but that's it. You know how keeping SOME things regulated is BETTER for the public? The electric company SHOULD have been kept regulated, in MY opinion. We sure would NOT have the problem with the trees we do now! Oh, well, what can we do but to call through the week and try to find an address that way! Again, just like last week, I did NOT accept any NEW books for review this week, AGAIN! Why not? SAME REASON AS LAST WEEK! I am overflowing with books! I need time to be able to read them and write the reviews! With things like power outages and my muscle issues, things sometimes get in the way. I hope you understand! Behind Closed Doors by BA Paris! You can read it HERE! That's all because the electric went out. Ho, hum. Monday or Tuesday I will be posting Who Do You Love by Jennifer Weiner! Wednesday, The Regulars by Georgia Clark - in a Blog Tour for that book! Wow! Those last 10 books are a LOT to catch up on, but manageable! However, they would NOT be IF I were to take on any NEW books, so I'm sure you can understand why I am not taking on ANY new books, unless they are mailed to me by the publishers! I also have books that were mailed to me by the publishers that I have not YET gotten to because I was in demand! It's WONDERFUL to be wanted, but sometimes that can backfire if you are not able to post, such as the electric going out, being ill, especially for someone like myself who has this muscle disease! There are days I am not up to writing reviews. I honestly think if I had a different keyboard things might be different because this keyboard has the letters way UP at the TOP of the board! That makes it hard to type. After I catch up on THESE, I will feel AWESOME!!! That will be an AMAZING feeling! I STILL HAVE MORE books on my list at NetGalley, yet! Yes! However, those are to participate in Blog Tours with! I have shown those, but you'll still be surprised when you see the books! I AM anxious to read ALL of these books! Yes, I figure if I can clear out my NetGalley shelf, first, I will feel GREAT!!!!! GIVEAWAY!!! "BACK TO THE BOOKS $250 #CASH #GIVEAWAY" starts Wednesday, August 17th!!! SAME day as I post my review for The One Man! This Giveaway will be in the LEFT side column when you come to the blog UNLESS you click through what you get in your feed! This Giveaway runs for 2 weeks! I hope YOU can reach your goals, too! Do you have any goals you are trying to reach? Let me know below! I'd LOVE to share in you goals with you!! Happy reading for the week ahead! I'm sorry about your power outage, that must have been frustrating. I live in California where it is not humid in the summer (but we do have Earthquakes, so nowhere is perfect, right?). I couldn't deal with the humidity. It's so smart of you to catch up on books, rather than get bogged down with a bunch of new books. That has been a constant source of pressure for me. I will aspire to be more like you. Have a good week. Thanks for the nice compliment! However, it DID take me OVER 5 YEARS to finally decide to NOT accept ANY NEW BOOKS for review until I catch up! Like you said, sometimes you feel you are under constant pressure! YEP! I did! I said to myself, "Self, this MUST STOP!" So I did take steps to STOP IT! It feels SO GREAT, too! What I have listed here are my NetGalley books. I have this HUGE pile of print books I have to review yet, too! I NEED to hit these, too! Once I get a few more NetGalley books knocked down off that list, I will most likely alternate between ebook and print books. Reading print during the day when it's easier to see it, and ebook at nighttime because it's easier to see the Kindle then! Although, sometimes when you find a book that is SOOOOO great, no matter what type it is, I'll ONLY read that book! Thanks for leaving a comment! I LOVE these!! You have a wonderful last few weeks of summer! Can you believe it??!! It's MID August already! WOW!!! Our kids do not go back to school until after Labor Day - it's LAW now! The reason: Tourism for our state!! NO KIDDING!!! Yep! Thanks to our Governor, now school goes later into the summer, almost to the end of June so the kids start the day after Labor Day. I guess in a way it makes more sense this way because they would bring the kids back to school for 3 days before they had the Labor Day weekend off! That was always irritating, I remember, when my kids were young! Sorry to hear that! I'm catching up on books too, and I like your list as well. Hey! Great minds think alike!! We are doing the same thing at the same time, catching up on our books! It feels GREAT, doesn't it!! I'm glad you like my list! I do, too! It is ALL super good reading! I left one out that I bought for myself, and this Sunday morning I have been reading it! It's really good, "At the Water's Edge" by Sara Gruen, author of Water for Elephants! I just noticed the title! BOTH have "water" in them! I wonder about her other books? I will say she sure can keep your interest in a book! Even if you have to put it down for some reason, WOW! You ARE picking it back up! She is a really good author! Happy Summer! Enjoy it because we are nearing the end already! I can't believe it! I noticed the date just a bit ago, and where did it go? Wow!!! I hope to see you next week, and I'll be stopping by your place if you have one, too! I have a guest reviewer for Don't You Cry so look forward to hearing your thoughts. Thanks for stopping by! Yes! The trees! We have storms scheduled for later today/tonight, and it IS cause for concern! I forgot to call Edison this week! Darn! HOW could I have forgotten to do that? UGH!!! Oh, well. We are currently charging our electronic devices so we can read and go online later!! I think our Kindle Fires have 3G so we are SUPER lucky with those!! Oh, wow! You have Guest Reviewers! HOW NICE!!! What a HUGE HELP!!! I can't WAIT to hear what they have to say about Don't You Cry by Mary Kubica! I believe it's getting 5 star reviews!! I'm super interested in the review and will be watching when I stop by your blog today! Thanks for telling me!! You wrote this - I can't tell while I'm replying! LOL! I'm writing this reply Saturday, Aug 20th at 2:30 and guess what? It's SUPER HOT OUT AGAIN!! I've had ENOUGH of this weather!!! I am SO HOT I am just drenched! GREAT thing I am wearing my hair STRAIGHT because I could NEVER hold a curl with weather like this! It's also the humidity that's a KILLER! It's like breathing water! Thankfully I SIT to write the posts out, and I turn the fan on! NICE!!! I did look up the temperatures for Celsius and I AGREE with you!! I could not handle anything above mid 20's, too! I'm with you! England is not a hot country, unless maybe you are down at the south end on the beach?? I've always wondered about that, if you could vacation in the south of England and have it be warm enough to go comfortable without a coat in south England in the middle of winter!! You'll have to let us know! Thanks so much, again, for stopping by! I'll see you next week, too!